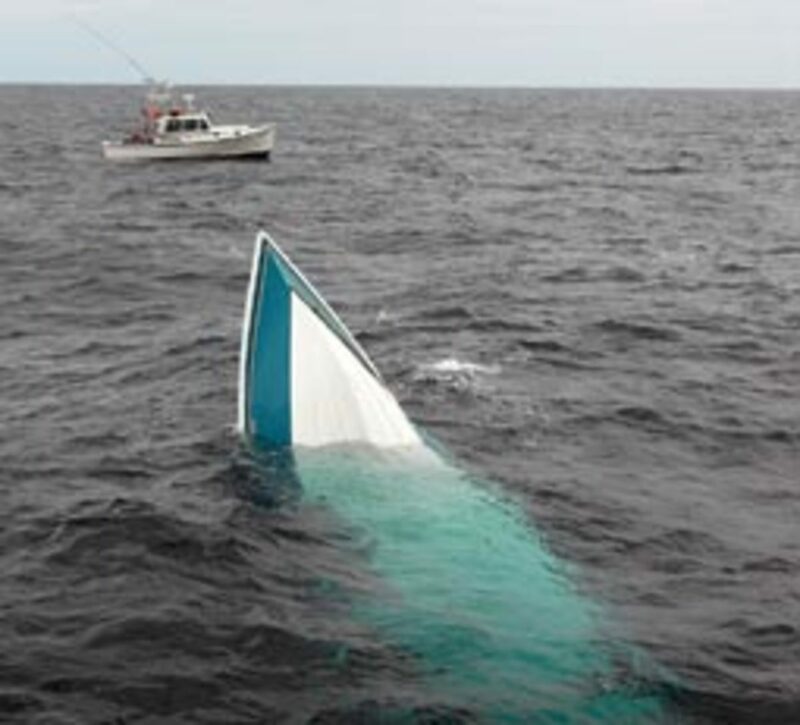 The bow of a 31-foot pleasure craft rises from the water May 11 30 miles off Cape Lookout National Seashore, where it was found capsized by the Monica M, the fishing vessel in the background. 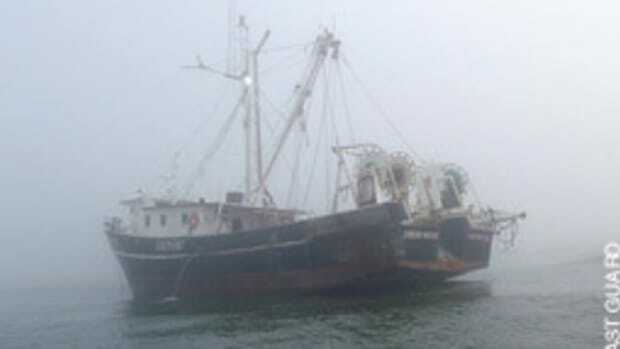 The Monica M found one man clinging to the hull and pulled him to safety. The Coast Guard suspended its search for two missing men. The Coast Guard suspended its search at 8:10 p.m. for two missing men after their 31-foot Fountain capsized the previous morning and a third man aboard was rescued 30 miles outside of Beaufort Inlet near Big Rock in Carteret County. The Coast Guard suspended its search after covering about 3,000 square nautical miles in two days. The survivor was found by the crew of the fishing vessel Monica M and taken to Onslow Memorial Hospital for treatment of dehydration and exposure. The Coast Guard medevaced a 66-year-old man from a sailboat 113 miles off the coast of Cape Henry. The sailor was airlifted from his vessel by a Coast Guard rescue helicopter crew from Coast Guard Air Station Elizabeth City, N.C., and transported to Sentara Norfolk General Hospital. Watchstanders at the Coast Guard 5th District Command Center received a call from the sailor&apos;s friend. The friend had stopped receiving electronic updates from the 31-foot sailboat Lancastrian, whose owner was sailing the vessel alone from Norfolk, Va., to Scotland. Watchstanders diverted the container ship M/V President Jackson, a participant in the Automated Mutual Assistance Vessel Rescue system (AMVER) to the vicinity of the last known location of the Lancastrian. The President Jackson was able to locate the sailboat, which was adrift, but the merchant vessel&apos;s size prevented it from rendering assistance. The oceangoing tugboat Julie, another participant in AMVER, was also diverted to the scene and its crew was able to lower a boat into the water and pull alongside the Lancastrian. The crew of the Julie contacted the Coast Guard command center and reported that the sailboat&apos;s owner seemed incapacitated. 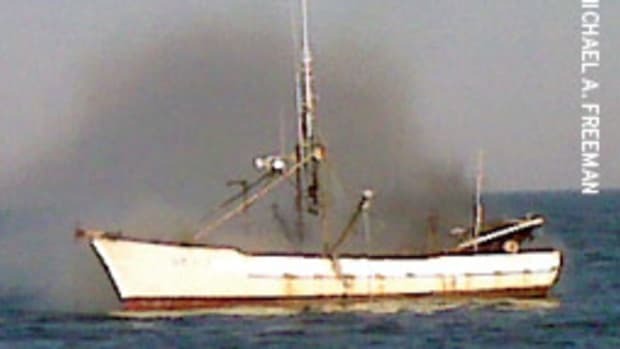 The Coast Guard released its final report of the investigation into the Oct. 22, 2008 sinking of the fishing vessel Katmai, which sank in Amchitka Pass, Alaska. Of the 11 crew aboard the Katmai, four were rescued, five died and were recovered and two remain missing. The investigation and public hearings were conducted in Anchorage and Seattle by investigators from the Coast Guard with assistance from the National Transportation Safety Board. 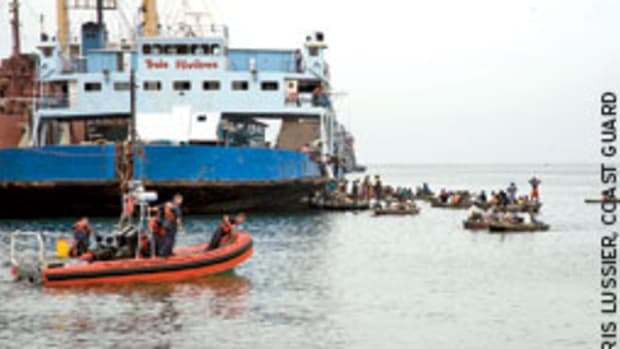 Several primary factors identified in the report include imprudent voyage planning; failure to maintain watertight boundaries; excessive loading of cargo in the vessel&apos;s fish hold and exposure to heavy winds and high seas. The cause of flooding in the engine room remains unknown. 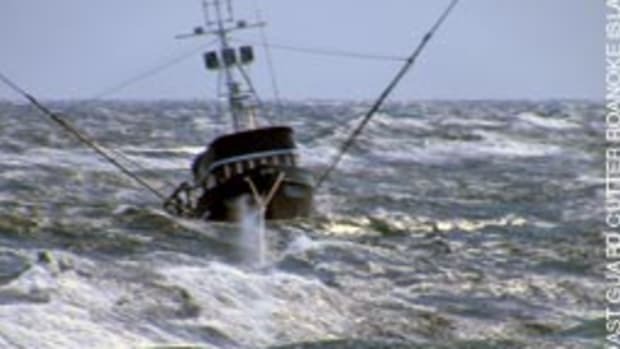 For more on the Katmai sinking, visit www.SoundingsOnline.com: keyword: Katmai. 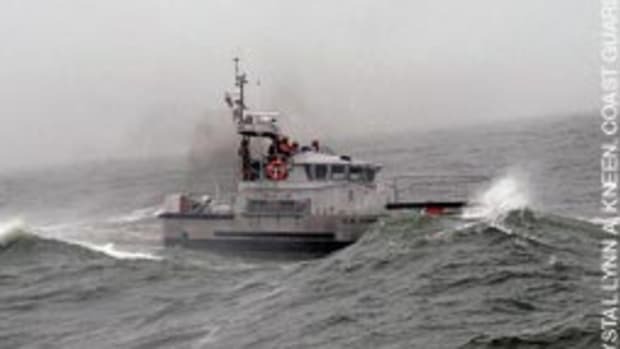 Coast Guard units saved two people in Hampton Roads. A crew from Coast Guard Station Milford Haven, Va., rescued two people whose sailboat capsized in Davis Creek, near Mobjack Bay. Vaja Sikharulidze, a citizen of Georgia, pleaded guilty to violating the Act to Prevent Pollution from Ships, in violation of Title 33, United States Code, Sections 1901, et. seq. Sikharulidze, 59, was the chief engineer of the Motor Tanker Chem Faros, a 21,145 gross-ton oceangoing cargo ship. The ship was operated by Cooperative Success Maritime SA and regularly transported cargo between various ports in Asia and the United States, to include Morehead City, N.C. The investigation revealed that from March 4 through March 29, Sikharulidze, who had overall responsibility for the engine department, failed to maintain an accurate oil record book for the disposals of oil residue and discharges overboard and disposal of oily sludges, oily mixtures, slops from bilges and bilge water that accumulated in machinery spaces. Specifically, the oil record book failed to show discharges of oil-contaminated waste made without the use of the ship&apos;s pollution prevention equipment. 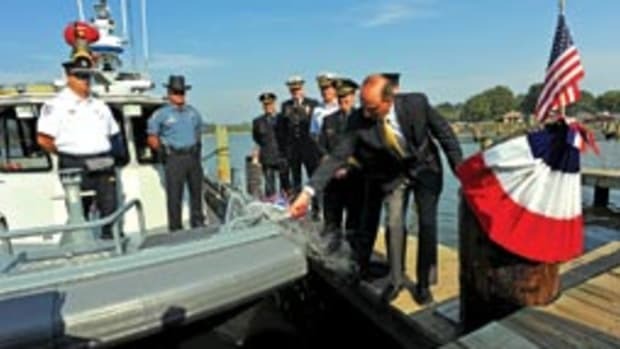 Further, from September 2009 until March 2010, engine department crew members pumped oil-contaminated waste directly overboard by using a pipe that bypassed the OWS. 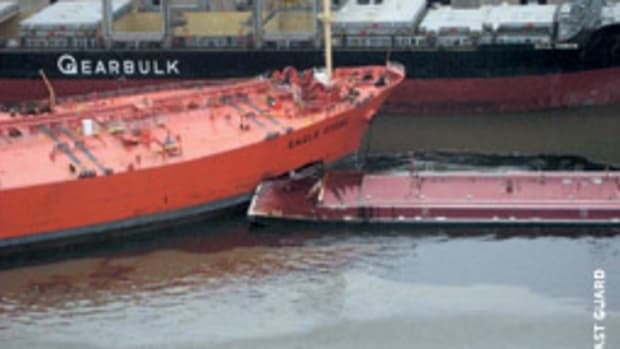 On at least one occasion between March 4 and March 29, Sikharulidze directed subordinate crewmembers to bypass the ships&apos; OWS and pump oil-contaminated waste directly overboard. This resulted in about 13,200 gallons of oil-contaminated waste to be discharged into the ocean. The Coast Guard suspended its search at 2:01 p.m. for four people aboard a boat reportedly taking on water in the Middle River. Coast Guard Sector Baltimore watchstanders began coordinating the multiagency search after receiving a mayday call on channel 16 from the operator of the vessel in distress at 2:48 a.m., reporting that his 28-foot pleasure boat had one adult and three children aboard and was taking on water. 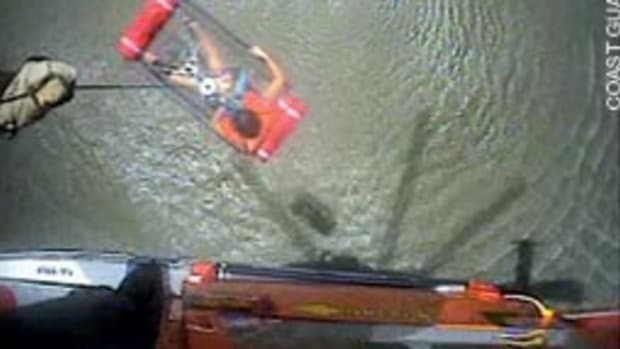 The Coast Guard rescued two people when the personal watercraft they were aboard went aground in a marsh near Wildwood. The Coast Guard received a call at 4:18 p.m. from a member of the New Jersey State Police reporting a grounded PWC; the passengers could not get out to walk because they would sink in the mud. The New Jersey State Police arrived on the scene, but because of the shallow water no boats could get into the area to assist. A rescue crew from Coast Guard Air Station Atlantic City, N.J., arrived on the scene and hoisted the two people aboard their helicopter. This article originally appeared in the Mid-Atlantic Home Waters section of the July 2010 issue.